A new recipe for apple pie can bring fame and fortune to a chef, but he still might not be able to sue other cooks who steal his idea. However unique, the recipe might not meet federal statutory requirements for an original creation that deserves copyright protection against infringement, or the illegal copying of another’s work. 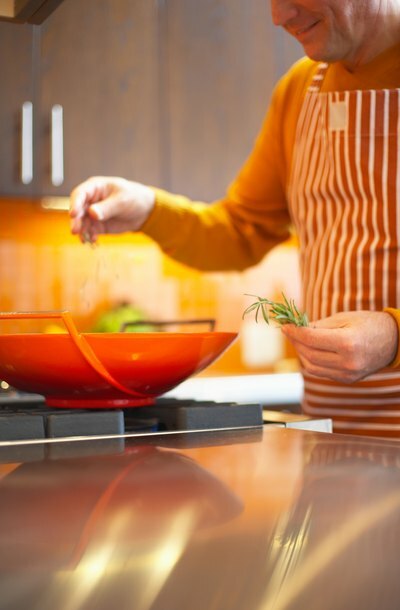 Recipe copyright laws are not firmly established, and professional cooks often freely duplicate each other’s recipes with or without attribution. Judgments against recipe thieves are rare, but you should seek advice from a copyright attorney before using someone else’s recipe in your restaurant, cookbook or blog. Until the early 1960s, U.S. courts applied federal copyright laws to recipes. In 1884, a cookbook author who copied another writer’s recipes was found guilty of copyright infringement, and in 1924, a federal court ruled that recipes on a bottle label contained the artistic originality necessary for copyright protection. But this trend changed in 1963 when Melville Nimmer’s treatise on copyright law argued that most recipes were not worthy of copyright protection because their list of ingredients was predictable and their how-to steps qualified as procedural explanations not protected under the U.S. Copyright Act. Applying Nimmer’s analysis, any recipe for apple pie would not be original because it must contain apples as ingredients and give instructions for how to make a pie. According to the U.S. Copyright Office, as of 2011, a recipe might qualify for copyright protection if it satisfies at least one of two conditions. First, it must have “substantial literary expression,” such as an author’s narrative about her Italian ancestors using ingredients from a backyard garden to make tomato sauce, or a compilation of sugar-free recipes assembled by a cook in an original manner. Second, the recipe must be in written form, although not necessarily published. Under either condition, copyright protection begins as soon as the recipe takes a tangible form; its author does not need to file a copyright application. Copyright duration depends on specific facts surrounding that recipe’s creation, but if it was created after January 1, 1978, the copyright usually will last for its author’s lifetime, plus 70 years. Some legal scholars, such as law professor Christopher J. Buccafusco writing in the Cardozo Arts & Entertainment Law Journal, argue that recipe copyrights may conflict with the goals of U.S. copyright laws. He theorizes that individual chefs might stop experimenting in their fields out of fear they would unknowingly duplicate another chef’s creation. The goals of U.S. copyright laws are to promote learning, enrich the public domain and allow a creator of original works to enjoy financial success that comes from monopolizing the market for a limited time. But recipe copyrights could have the opposite effects because chefs and recipe developers might not be willing to prosecute recipe thieves who actually are helping to advertise a winning recipe through their copycat versions. Under the U.S. Copyright Act, you can photocopy a favorite recipe from a magazine to prepare at home and defend yourself against charges of infringement by citing the fair use doctrine. That doctrine considers that the purpose of your use is non-commercial and unlikely to deprive the recipe’s creator of his monetary rewards. But don’t assume the fair use doctrine gives you blanket protection: author Cheryl Besenjack says in her book, "Copyright Plain and Simple," that the more copies of a recipe you make, the greater your chances of being sued for copyright infringement. The Washington Post: Can a Recipe Be Stolen? Gelf Magazine: Culinary Copyright: A Recipe for Disaster? The book publishing industry is changing rapidly, but copyright laws continue to protect the rights of authors, whether their material is published on paper, online or as an e-book. Copyright protection gives authors, or the firms with whom they contract to publish their books, the exclusive right to distribute their works or create sequels for a set period of time. This helps to ensure that authors can make a living from their writing.